You can choose to earn a certificate for your future career or you can add a certificate on to your current degree to further your career. But, you have to ask yourself, which suits you the best? Both are great options if you are looking to get into a specialized career field. Below are some reasons why a certificate program may be the best fit for you. Efficient: If you are ready to get into specific career field faster than a certificate program would be the ticket. You could always go back or continue with an associates while you are working in your chosen career field. Convenience: Adding a certificate to your work experience may be the most convenient way for working professionals to add new skills and knowledge to their current position while maintaining a full-time job. Exploration: A certificate program can also allow you to examine if a certain career field is for you. It allows you to explore different facets of an industry and can help you dictate the direction you want to go in your career. Dedication: Going out of your way to further your education to add to your current position can show employers that you are dedicated to your career and that you are willing to go the extra mile to be successful. Skill: A certificate is unlike any other type of degree. A certificate educates on a specific skill-set that certain employers are looking to hire for. Along with the reasons above, adding a certificate to your current degree could advance your career in multiple ways. Stand Out: Adding a certificate to your current degree will stand out to employers. When employers read through dozens of resumes they’re looking for things that immediately stand out about a candidate, and a certificate will definitely stand out. Diversify: Coupling a certificate to your current degree can differentiate yourself from your peers which will give you and edge when it comes to competing for a certain position. 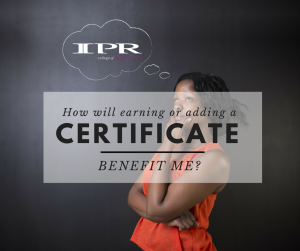 Earn More Money: Adding a certificate to your current degree could give you the potential to earn more money due to the additional skill-set you bring to the position. Overall, earning a certificate or adding a certificate to your current degree is a great way to sharpen and strengthen your expertise while gaining that edge above your peers. Below are two new certificates that the Institute of Production and Recording (IPR) are now offering; audio production and engineering and live sound and show production. By completing the Certificate in Audio Production & Engineering program at IPR, you’ll gain an understanding of core artistic and technical skills to start making your mark in the world of commercial music production—all in as few as 12 months. Click here to learn more. In IPR’s Certificate in Live Sound & Show Production program, you can prepare to play a crucial role in the planning, creation, and operation of live events in a variety of venues—all in as few as 9 months. Click here to learn more.